Ben Mattlin, our special contributor, is a veteran writer-editor of articles on finance, market analysis, tax planning and investments for major national publications. But when it came to writing about his own disability, he faced some different challenges. 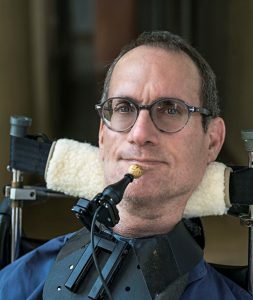 (Ben, 55, was born with spinal muscular atrophy, a congenital muscle weakness that can cause paralysis, respiratory and other health issues.) Here he reveals why writing about himself was a whole different story. I got my first book published through an old high school friend who works in publishing. At first, I hated the very idea of writing “I did this,” and “I felt that,” or “such-and-such happened to me.” There had to be some justification, a reason why anyone should want to know how I survived spinal muscular atrophy and learned to live with it (not that I had much choice about it). Only when it became clear to me that I had a message beyond my life story did I decide to write a memoir. I would put my tale of growing up with a disability in a historical context—the context of the disability rights movement. So the book became my way of explaining what this movement can mean. Actually, the title of the book says it all: MIRACLE BOY GROWS UP—How the Disability Rights Revolution Saved My Sanity. It was definitely a memoir, not an autobiography; it didn’t cover every detail of my life. In fact, the book ends shortly after my wife and I had children. But some readers wanted more. More? But come now. It’s hard to examine a marriage you’re living in every day. No writerly distance is possible. It was suggested that my wife, who does not have a disability, should write the sequel, but she’s a private person who has no interest in writing. She goes along with what I’m writing, but she has no desire to produce even a chapter. Nevertheless, I then came up with a possible solution. Why not write about marriages like mine, not just mine? As with the first book, I would give my story a social context. Go beyond my own experiences. In other words, use my own marriage as an entry point to other, similar marriages. The germ for what would become IN SICKNESS AND IN HEALTH–Love, Disability, and a Quest to Understand the Perils and Pleasures of Inter-abled Romance was born. Next came the research. For the first book, I only had to research my own memories and a smattering of highlights from the disability rights movement. But this one would require more digging. For me, the hardest part was balancing all these different love stories at once. I would finish a preliminary interview with one couple when another couple would became available. Then that couple would go on vacation for a month, and I had to track down a third couple. Finally, I had to find a way to organize these disparate stories into a cohesive book. I decided to put the individual pieces in age order, from youngest to oldest. And through it all, I weaved the tale of my own marriage. I tend to write quickly once I have completed my research. When the manuscript was finished enough to show, my new publisher (landed partly on the strength of my first book) suggested some changes, which I made. Next came promotion and publicity. The publicists did all the dirty work of propositioning various media entities for coverage. All I did was write op-ed essays that could be linked to the book in some way. One was about romantic stereotypes, for instance. Just weeks before the book was officially launched, the New York Times graciously awarded me a “Modern Love” column, which I’d cobbled together from chapters of the new book. The truth is, long before I started writing the book, I had submitted an essay to Modern Love about my marriage. It was rejected. The piece that finally got published benefited, I think, from years of germinating. What will happen from here? So far reader response has been good, but it still takes an effort to get the word out, to let people know that the book is available. Yet as we know, disability is the only minority group anyone can join. In fact, the federal government projects that more than one in four of today’s 20 year olds will become disabled before age 67. So that should be a pretty big readership, no? 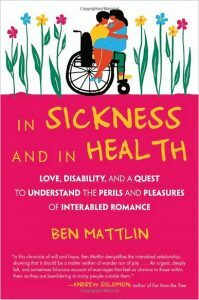 Here are the clickable links to Ben’s books on Amazon: IN SICKNESS AND IN HEALTH: Love, Disability, and a Quest to Understand the Perils and Pleasures of Interabled Romance. He is also the author of Miracle Boy Grows Up. If you do happen to pick up or download a copy (it’s in hardcover, e-book format, and audio format) Ben asks that you post a review on any website that’ll take it. “I’ll be checking” He says. Hi Ben! I read your Modern Love piece and found it lovely, it gave me a clear and honest glimpse of what an “inter-abled romance” can look like, and it’s always nice to learn about the experiences of people who’ve been successfully coexisting together for so long, isn’t it? Haven’t had a chance to read your book just yet but it seems to me you’ve got this “writing about my life” thing quite figured out, congrats!